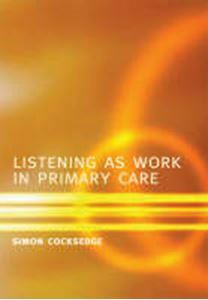 Quick overview Although based on a study of doctors in primary care this book has lessons about listening for anyone in the caring profession. It combines theoretical argument, anecdotal evidence and analysis. 'This book has arisen from reflections on patients' everyday stories in my work as a general practitioner. Over several years I have reflected on the mandate that general practitioners are given by society to listen and be available if required. The field of study is the everyday business of being a family doctor and the inter- and intra-personal phenomena that arise as a result.' Combining analysis of detailed accounts by general practitioners of their everyday work with theoretical argument, this book is an invaluable read for medical professionals in primary care, students of medicine and nursing, GP tutors and all healthcare professionals directly involved with patients.